The Malaysian Army (Malay: Tentera Darat Malaysia) is the land component of the Malaysian Armed Forces. Steeped in British Army traditions, the Malaysian Army does not carry the title ‘royal’ (diraja) as do the Royal Malaysian Air Force and the Royal Malaysian Navy. Instead, the title is bestowed on selected army corps and regiments who have been accorded the honour by the Yang di-Pertuan Agong, who is the Supreme Commander of the Malaysian Armed Forces. 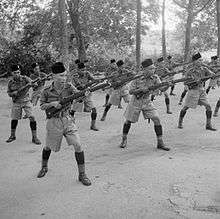 c. October 1941, Malay Regiment operatives at a bayonet practice before the Battle of Singapore. The first military units in Malaysia can be traced back to the Penang Rifle Volunteers raised on 1 March 1861,[note 1] and the Malay States Volunteer Rifles which existed from 1915 to 1936. The birth of the modern Malaysian Army came about when the Federal Council of the Federated Malay States passed the Malay Regiment Bill on 23 January 1933. This allowed the initial recruitment of 25 males for the First Experimental Malay Company on 1 March 1933. Major G. McI. S. Bruce of the Lincolnshire Regiment was the first Commanding Officer. By 1 January 1935, the Experimental Company became The Malay Regiment with a complement of 150 men. 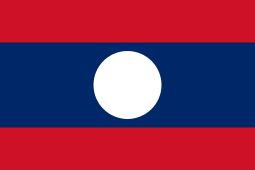 A battalion was formed on 1 January 1938 and eventually a second battalion on 1 December 1941. 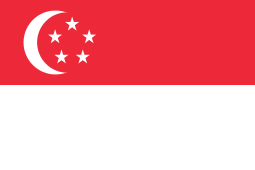 The 1st Bn Malay Regiment was famous for its defence of Opium Hill or Bukit Chandu in Singapore. The ‘Battle of Opium Hill’ on 14 February 1942 involved 42 soldiers commanded by Lt. Adnan Bin Saidi who defended their position against attack from the 18th Division of the Japanese Imperial Army under Lt. Gen. Renya Mutaguchi. 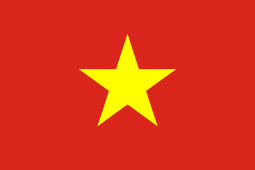 After World War II and during the Malayan Emergency, the number of battalions was increased to seven in the early 1950s. The Kor Armor DiRaja (Royal Armoured Corps) can trace its roots to the formation on 1 September 1952 of the Federation Reconnaissance Squadron. It was later merged with the Federation Regiment to form the Federation Reconnaissance Corps. The name underwent a few transformations from the Malaysian Reconnaissance Corps (16 September 1967), Royal Malaysian Reconnaissance Corps (May 1979) to Royal Cavalry Corps (December 1979) and finally to Kor Armor DiRaja (Royal Armoured Corps) on 8 December 1986. The Royal Ranger Regiment's lineage began in 1863 as the paramilitary Sarawak Rangers. Although the second in the order of precedence, it is the oldest active formation of the Army. 10 Paratrooper Brigade commando forces with ATMP (All Terrain Mobility Platform) during a parade. The Malaysian Army is currently organised into five Divisions and are placed under the Field Army Headquarters. 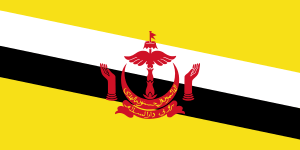 Three of which (the 2nd, 3rd and 4th Divisions) are based on the Malaysian Peninsular, while the two (the 1st Division and 5th Divisions) are based on Malaysian Borneo. The Grup Gerak Khas (Special Forces group), 10th Parachute Brigade and the Pasukan Udara Tentera Darat (army aviation) are independent formations and directly subordinate to the Chief of the Army. 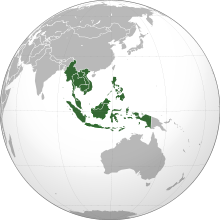 The Malaysian Army currently has 17 Corps or Regiments. These are grouped into 3 main components: the Combat Element, the Combat Support Element and the Support Elements. The Malaysian Army uses a rank structure inherited from the British Army. the Malaysian Army rank structure has 17 levels from Private (Prebet) to General (Jeneral). These ranks are divided into 2 groups - Officer (Pegawai) and Other Ranks (Lain-Lain Pangkat) which includes the Non-Commissioned Officer (Pegawai Tanpa Tauliah) ranks. Junior Officers This group consists of Second Lieutenant (Leftenan Muda), Lieutenant (Leftenan) and Captain (Kapten) grade officers. Senior NCO (PTT Kanan) This group includes NCOs holding the rank of Sergeant (Sarjan), Staff Sergeant (Staff Sarjan), Warrant Officer II (Pegawai Waran II) and Warrant Officer I (Pegawai Waran I). Junior NCO (PTT Rendah) This group includes NCOs holding the rank of Lance Corporal (Lans Koperal) and Corporal (Koperal). Private (Prebet) Private soldiers in the Malaysian Army do not wear any rank devices on their uniform. There are no distinctions made between junior or senior Privates. Malaysian Army Agusta A-109E LUH, armed with 20mm gun and rockets for area suppression. 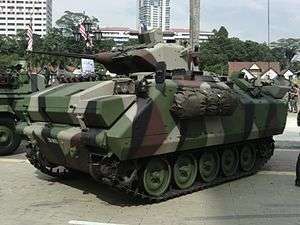 Malaysian Army PT 91M MBT on display. This is the most senior regiment of the Malaysian Army. Its ranks are recruited from amongst the Malay population. The Regiment has 25 battalions. The 1st Battalion, the most senior in the Regiment, currently undertakes ceremonial and Royal Guard duties. The remainder are configured as 20 Standard Infantry Battalions, two Mechanised Infantry Battalions and two Parachute Infantry Battalions. The regiment uses rifle green berets except two battalions that wear maroon berets. The 19th Bn Royal Malay Regiment (Mech) was involved in the rescue of US Rangers and Delta Force operatives in Somalia during the Battle of Mogadishu. The unit of 32 Radpanzer Condor APCs and 113 men from MALBATT 1 went in with the United States 10th Mountain Division to rescue the trapped Rangers. Four APCs were immobilised and were destroyed by US helicopter gunships. 19 Royal Malay Regiment suffered 1 soldier killed in action (KIA), PFC Mat Aznan Awang while 8 others were wounded in action (WIA). Pfc Mat Aznan Awang was later promoted posthumously to Corporal and was awarded with Pingat Seri Pahlawan Gagah Perkasa, the nation's highest gallantry award. In total, 7 officers and 26 NCOs were awarded various medals for their valour during the operation, the highest number of men recommended for medals in a single unit in a single operation. ACV 300 Adnan on display. This is a multi-racial unit organised along similar lines to the Rejimen Askar Melayu DiRaja. There are currently 10 battalions within this regiment. 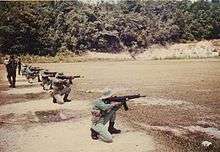 The Regiment traces its roots to the Sarawak Rangers and the Sarawak Constabulary, famed jungle trackers who had a deadly reputation during the Malayan Emergency and during the Communist Party of Malaya’s insurgency in Malaysia. The 8th Bn Royal Ranger Regiment (8 Renjer) was the first infantry battalion in the Malaysian Army to undergo conversion into an airborne battalion. The unit is currently assigned to the elite 10 Brigade (Para). The Malaysian Army's most decorated soldier, WOI (Rtd) Kanang anak Langkau was a Regimental Sergeant Major of 8 Ranger. This is a newly created regiment from the 300 series Territorial Army units in charge of the border. 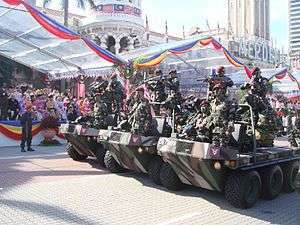 The Deputy Prime Minister and Defence Minister, Najib Razak, announced on 1 July 2006 the formation of a new regiment specifically for border patrol. Members of the regiment will be taken from various regiments and corps, most notably from the Rejimen Askar Wataniah. It is believed that the army will form about 2 to 3 brigades of this new regiment. The new regiment was officially raised on 9 February 2008 by Najib Razak at Tanah Merah, Kelantan. Kor Armor DiRaja (Royal Armoured Corps) provides the armour capability for the Malaysian Army. Currently, the Corps consists of 5 battalions (sometimes errantly referred to as Regiments), which are equipped with various armoured personnel carriers (SIBMAS AFSV-90, Rheinmetall Condor, K-200 MIFV) and light combat vehicles. Rejimen ke-11 of the Kor Armor DiRaja is the sole user of 48 PT-91M Main Battle Tanks from Poland. Rejimen Artileri Diraja (Royal Artillery Regiment) is the artillery corps of the Malaysian Army and provides artillery support and local air defence for army units. The regiment is equipped with 36 Brazilian-made Astros II multiple launch rocket systems (MLRS) and 28 G5 MkIII towed artillery guns from South Africa. Air defence is provided using a mix of Swiss Oerlikon twin 35 mm and Swedish Bofors 40 mm anti-aircraft artillery and missile systems such as the Jernas and Starburst from the UK, Anza from Pakistan, FN-6 from China and Igla from Russia. Malaysia committed to purchase Starstreak V-Shorads missiles from the UK in 2015. Rejimen Semboyan Diraja (Royal Signals Regiment) is in charge of strategic communication, tactical communications, electronic warfare and early warning systems such as radar. Kor Polis Tentera DiRaja (Royal Military Police Corps) deploys as part of the field army, in support of army operations, and enforces proper conduct among army personnel. Aside from being responsible for base security, the military police are also tasked with preventing and investigating criminal activities on army property or by military personnel. Rejimen Askar Jurutera DiRaja (Royal Engineers Regiment) is tasked with demolitions, bridge-laying and the repair of military infrastructure, such as airbase runways, or clearing obstacles in emergency situations. Kor Jurutera Letrik dan Jentera DiRaja (Royal Electrical and Mechanical Engineers Corps) is responsible for the maintenance of all vehicles and machinery of the Malaysian Army. Kor Risik DiRaja (Royal Intelligence Corps) specialises in psychological warfare (psyops), surveillance, intelligence, reconnaissance and counter-intelligence operations. Aside from handling propaganda and counter-propaganda, the corps is also tasked with conducting background checks on recruits when they first enroll in any training courses. Kor Ordnans DiRaja (Royal Ordnance Corps) ensures that all military supplies and ordnance are stored, secured and inventoried properly. Kor Agama Angkatan Tentera (Armed Forces Religious Corps) (KAGAT) performs religious (chaplainry) services for Muslim and Christian personnel of the Malaysian Army. It also provides counselling and conducts ritual prayers on the battlefield. Kor Perkhidmatan DiRaja (Royal Logistics Corps) is in charge of transporting troops and supplies to the various units of the Malaysian Army. Kor Kesihatan DiRaja (Royal Medical Corps) provides training for Army medics and other specialists. It runs the Armed Forces hospitals and provides the battlefield mobile hospitals. The unit has also provided relief MALMEDTIMs (Malaysian Medical Teams) to Pakistan, Afghanistan, Western Sahara, Indonesia and Palestine. Kor Perkhidmatan Am (General Services Corps) handles administration and financial management for the entire army. Rejimen Gerak Khas (Special Forces Regiment) is the Malaysian Army's special forces and commando regiment. 21 Gerup Gerak Khas is the operational home of various specialists and the Commando battalions, which are capable of conducting unconventional warfare or special operations. One of the known foreign operations involving this regiment was in an attack by Somali militia on a convoy transporting UN Intelligence Chief in UNOSOM II on 18 July 1994. In the action, two members of the regiment were killed in action, while another four were wounded. One of the injured men was taken hostage by the militia and was released nine hours later. 10 Paratrooper Brigade is an elite airborne unit tasked with being rapidly deployed inside or outside the boundaries of Malaysia. 10th Para is the key element of the Malaysian Rapid Deployment Force (Pasukan Aturgerak Cepat; PAC) and it is Malaysia primary main offensive force in time of war or emergencies. Pasukan Udara Tentera Darat (Army Air Corps) is the Army Aviation branch formed around a core of Royal Malaysian Air Force officers. This new Army formation is tasked with liaison duties, providing limited transport capabilities, close air support and also air reconnaissance using light observation helicopters. The unit currently has one squadron, No. 881 Squadron, which is equipped with 11 Agusta A109 light helicopters. The main Army Air Corps base is located in Kluang, Johor. Rejimen Askar Wataniah (Territorial Army) forms the second line of Malaysia's defence. Formed by college students, professionals and civilians, it provides support for the regular armed forces of Malaysia and is responsible for the security of key installations in times of conflict. Originally tasked with area and local defence, the Rejimen Askar Wataniah units have been reconfigured and will perform front line duties alongside regular units when the need arises. Rejimen Askar Wataniah units, such as armoured squadrons, are integral units of several Kor Armor DiRaja regiments. Malaysian Army reservists at the range. The personnel strength of the Malaysian Army is approximately 80,000 personnel in the Active Army, 50,000 in the Active Reserve and 26,600 active and 244,700 reservists in the paramilitary. Since the recovery from the 1997 economic crisis, Malaysian Army, along with other branches of the Malaysian Armed Forces, has regained momentum in its modernising programs. The first major procurement was to set a milestone by building its first ever main battle tank regiment. 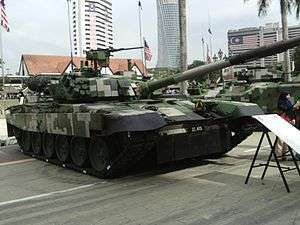 Malaysian Army received delivery of 48 PT-91M main battle tanks and other tank-based equipment, like ARV WZT-4 from Poland, fully completed contract of sale in March 2010. Despite adding some 28 units of South African G5 Mk III 155 mm howitzers, another major procurement was 18 units of Astros MLRS from Brazil, which delivery was completed in 2006. A second batch of 18 MRLS was ordered in 2007. 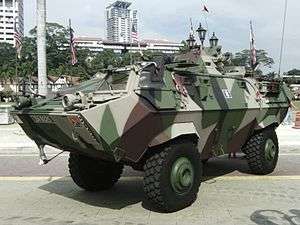 Malaysian Army is also rapidly mechanising its current inventory - 211 Adnan IFVs (Infantry Fighting Vehicle) were acquired by the army in 2004. Following a more recent procurement of the Pakistani Bakhtar-Shikan Anti-armor missile launcher, these were installed on the Adnans. Malaysian Army is now shifting its emphasis on enhancing its air wing. In September 2006, Malaysian Army received its 11th and last Agusta-Westland A109H Light Utility Helicopter. These helicopters are to initially complement, and ultimately replace, the ageing SA316B Aérospatiale Alouette III helicopters. Six of them were to be installed with light arms and to be tasked to a scout observation unit; a sample was shown in LIMA 07. The configuration of the remainder is unclear. Furthermore, the army will also receive S61A-4 Nuri multipurpose helicopters after they are retired from RMAF; these will form the backbone of the army’s very first air transport units - 881 and 882 squadrons of the army air wing. In the same year, at the biannual Defence Services Asia (DSA) 2006, Malaysia announced that the US made M4 Carbine service rifle will replace the Austrian-made Steyr AUG service rifle for all three Malaysian Armed Forces services. The army will receive the new weapon soon. There is also a requirement for an upgrade to the current air defence network. However, a dispute between the army and the air force on whether to introduce a mid-range SAM system had led to the procurement being put on hold. According to a recent interview of the army’s chief of staff, Ismail bin Haji Jamaluddin, the army has no intention of taking over the mid-range air defence role. The Malaysian Army currently has a soldier modernisation programme called the Future Soldier System. Under the FSS, The Malaysian Army plans to equip all soldiers with Personal Protection Equipment (PPE) such as Kevlar helmets, Kevlar vests, Oakley goggles and ear protection equipment. The programme also includes arming all the standard issue M4 carbines with SOPMOD kits, as well as equipping soldiers with a Glock series pistol. Sapura, a Malaysian electronics company, is offering their SAKTI soldier system concept via work in three areas: Head Sub-System (HSS), Body Sub-System (BSS) and Weapon Sub-System (WSS). The HSS consists of a Helmet–Mounted Micro Camera and night vision capability with a data output, helmet-mounted display and earpiece and microphone; the WSS consists of a Rifle Control Unit consisting of a five-button wireless controller for one handed use with key features including push to talk for the radio, switching the HMD on and off, turning the HMD brightness up and down as well as video transmission to friendly forces. The BSS consists of a controller system, energy unit with a power pack for the communication interface, micro-camera and HMD with a single polymer lithium ion battery for up to ten hours of operation; a communications interface for secure IP based radio which from the image is a Thales St@rmille radio and finally a navigation unit with a display for blue force tracking and situational awareness, colour digital mapping and terrain and urban profile analysis. The system displayed is visually similar to the Kord Defence SmartGrip RIC developed in partnership with Thales Australia. ↑ 1 March is marked as Army Day in honour of the Penang Rifle Volunteers (PRV) raising as the first military unit in the Malay Peninsula. 1 2 "Malaysian Armed Forces". Global Security. Retrieved 1 March 2016. ↑ "Tentera Darat pertingkat kesiagaan pertahan dua wilayah secara serentak" (in Malay). New Sabah Times. 2 March 2014. Archived from the original on 5 March 2014. Retrieved 2 March 2014. ↑ "Ministry sets up brigade to beef up border security". The Borneo Post. 13 February 2016. Retrieved 13 February 2016. ↑ "Army Rank (Pangkat Tentera Darat Malaysia)" (in Malay and English). Malaysian Army. Archived from the original on 11 December 2010. Retrieved 22 January 2016. ↑ "Kerajaan Cadang Wujud Rejimen Pengurusan Sempadan" (in Malay). Bernama. 30 June 2006. Archived from the original on 3 February 2009. Retrieved 31 January 2015. ↑ "Rejimen sempadan ditubuh" (in Malay). Utusan Malaysia. 30 January 2008. Retrieved 8 April 2010. ↑ "Malaysia To Buy Starstreak V-Shorads Missiles". Defense World. 30 July 2015. Retrieved 19 October 2015. 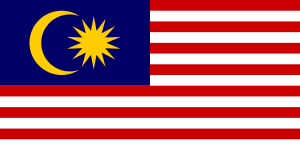 ↑ "Malaysian Flag Flying High in Afghanistan". Bernama. 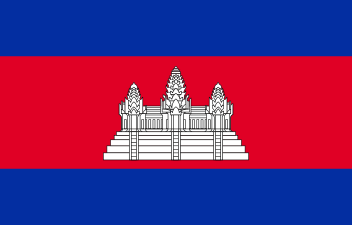 NAM News Network. 24 October 2010. Retrieved 25 October 2010. ↑ "Astros II Artillery Saturation Rocket System, Brazil". army-technology.com. Retrieved 31 January 2015. ↑ Marhalim Abas (28 February 2015). "Army's RMK11 Wish List Part 2". Malaysian Defence. Archived from the original on 19 March 2015. Retrieved 1 March 2015. ↑ Marhalim Abas (2 March 2013). "AV8FS". Malaysian Defence. Archived from the original on 11 January 2015. Retrieved 1 March 2015. ↑ "SAKTI: Malaysian Progress". 9. Soldier Modernisation. May 2012. Retrieved 1 March 2015. Wikimedia Commons has media related to Malaysian Army.